Craving for noodle? 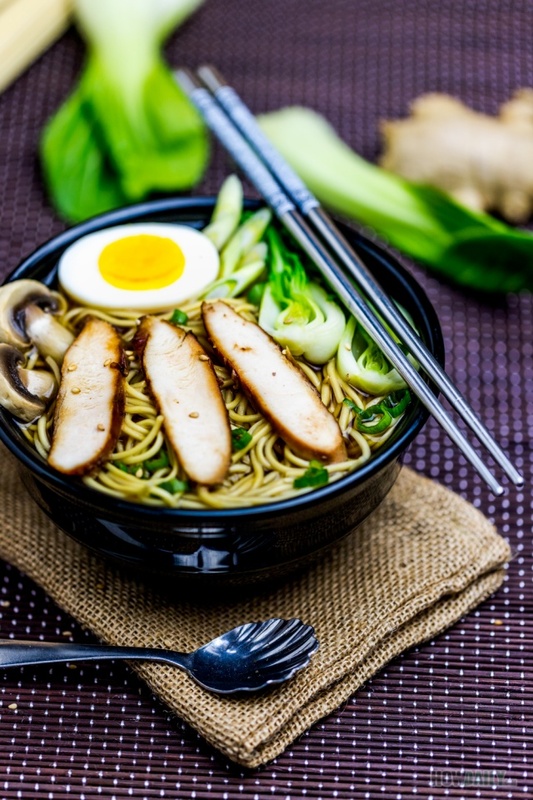 Here is an easy way to cook Japanese chicken ramen that is both healthy and savory delicious. Most, if not all ramen bowls heart lie within their broth and excitable toppings. 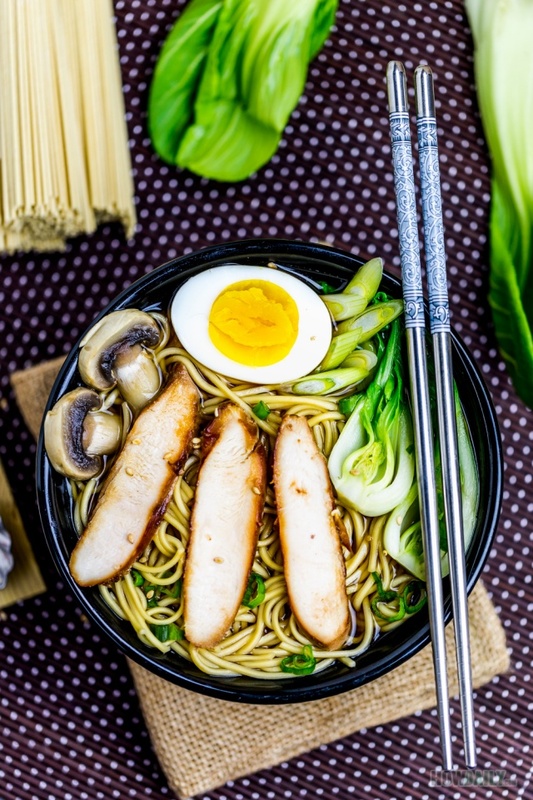 So does this Japanese inspiration, which focus mainly on cooking the broth to full of flavor and sauteing all topping ingredients (in this case are chicken, egg and bok choy). For the broth, to save time, I just use chicken stock instead of bone stock from scratch since this is just quick cooking for two people portions. Pick the unsalted one so you can have full control over the taste and adjusting if need. Nevertheless, to add the umami sweetness, I would simmer the stock with kelp and bonito flakes just as the traditional way to make dashi. If you don’t have bonito flakes, substitute with dried shrimp, dashi powder, or similar flavoring. At the very least, some small amount of seafood stock can be used too, but dashi the normal way would definitely distinct the flavor. Seasoning with soy sauce would give this broth a nice brownish color while there is no need to add sugar since most soy sauces have some sweet after taste already. The final broth should be light, fragrant, heartily healthy yet full of natural sweetness with umami flavor and vegetable toppings. Go light and skip the salt if you can, cause most ramen should be salty enough. Chicken breast in this recipe required prior marinating with soy sauce, then pan-sear and roast/cook. This way would help preserve the juice inside with full flavor. If this is too much trouble, you can just boil them within the broth then shred to pieces. Same with egg. Most ramen bowl would have some sort of egg, often marinade with soy sauce overnight, however, for a quick bowl, poached egg would do. If you are using bok choy, lightly dip/cook them in broth before serving would be sufficed. For spinach though, it’s better to saute them with garlic beforehand to amplify the flavor. 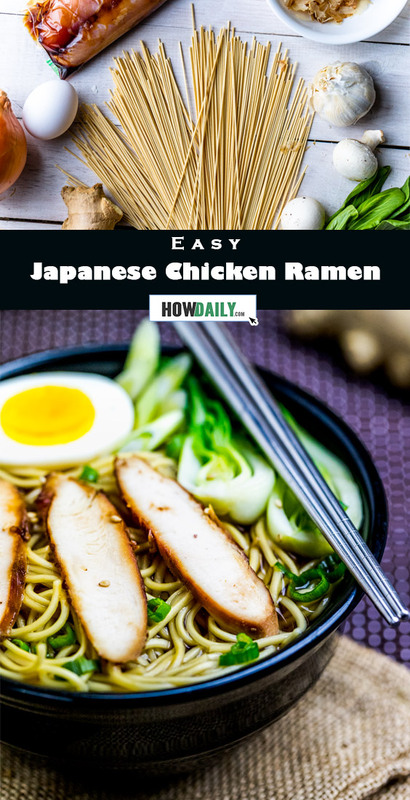 Light savory broth with flavorful & juicy chicken over chewy ramen are all so calling in this easy homemade chicken ramen recipe. 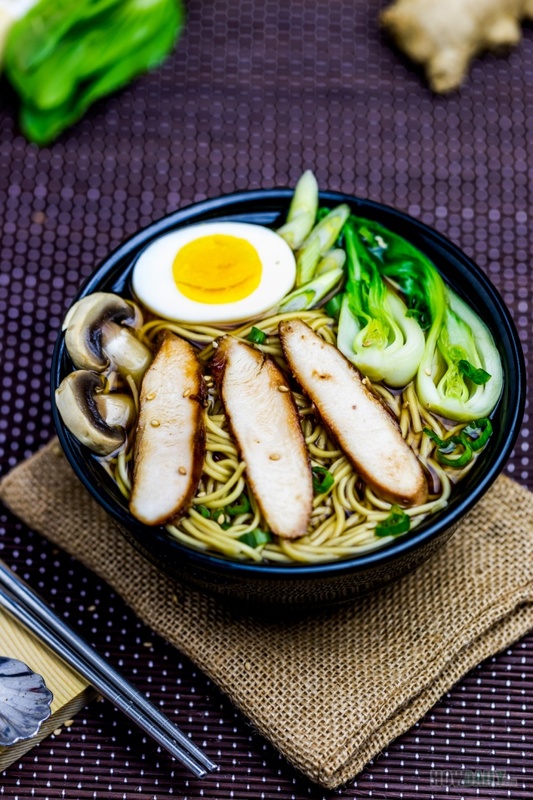 Inspired from the popular Japanese ramen, this noodle bowl utilized soy sauce and mushroom as the main accompany for chicken flavor. In a zip lock bag, marinade chicken with 2 Tbsp soy sauce and dash of ground pepper. Add chicken stocks to pot, drop a couple kelp pieces and bonito flakes (if use). Bring this to boil over medium heat. Once boil, reduce heat and simmer for about 15 minutes. Strain and discard all solid. Now add back the above liquid stock along with sliced ginger and the white head part of green onion to pot. Simmer this over medium-low heat. When come to low boiling point, slice mushroom and add to pot. Also season with 2 Tbsp of soy sauce. Adjust season to a tad bit lighter than your desired taste. Add 1 Tbsp of oil to a hot pan over medium heat. Sear the chicken breast on both side. Once done, set aside to cool off naturally and slice. Boil the egg to your desire. See this guide to control your egg softness level. Peel off shell and cut into halves. Dip bok choy in broth or saute spinach over medium-high heat with crushed garlic as well. Chop the remaining green onion to prepare for garnishing. 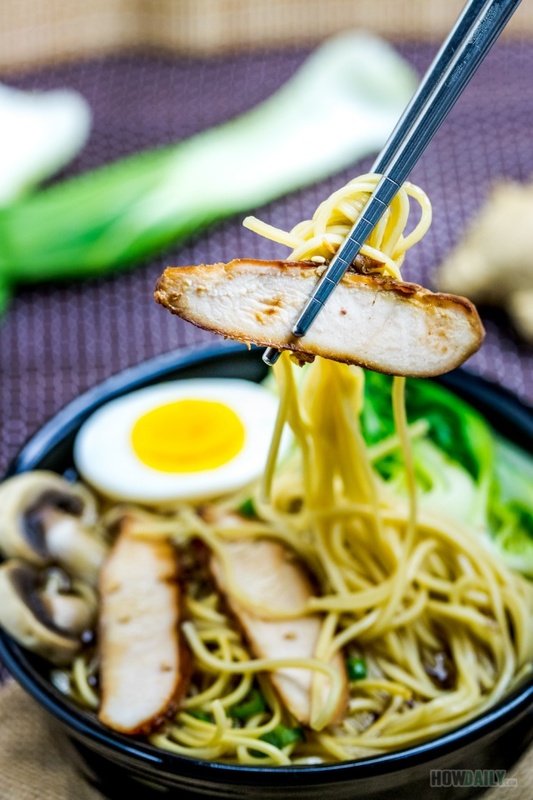 Prepare ramen according to package instruction or simply dip and stir them in boiling water (to loosen of those extra oil and sodium content). Divide ramen into bowls. Add a couple slices of chicken onto one side of each. Now add bok choy/spinach as well as poached egg and mushroom. Ladle broth onto bowl with few slices of mushroom. Garnish with chopped green onion and serve hot immediately. Try to multitask between marinating, making broth and toppings. 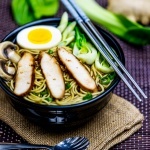 Substitute ramen with udon, egg noodle or rice vermicelli for variation.